Renault, one of the fastest growing automotive brands in India, launched the Renault KWID 02 Anniversary Edition today, to celebrate the second successful anniversary of the Attractive, Innovative and Affordable Renault KWID. The sporty second anniversary edition portrays KWID’s unique and urbane elements, which further enhances the lifestyle quotient of the Renault KWID. 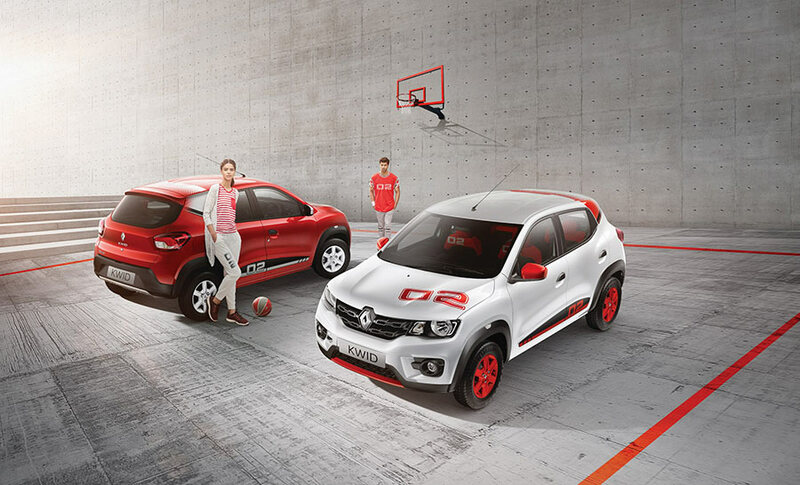 It will be available in Kwid’s two largest-selling colours, red and white. The Renault KWID 02 Anniversary Edition will be available in both 0.8L and 1.0L powertrains, in the RXL and RXT variants, manual transmissions (MT). The Anniversary Editions of KWID RXL 0.8L SCe and KWID RXT 0.8L SCe will be offered at INR 342,800 (ex-Delhi) and INR 376,400 (ex-Delhi) respectively, only INR 15,000 more than the existing KWID RXL and KWID RXT 0.8L SCe variants. Likewise, Anniversary Editions of KWID RXL 1.0L SCe and KWID RXT 1.0L SCe will be offered at INR 364, 400 (ex-Delhi) and INR 397,900 (ex-Delhi), only INR 15,000 more than the existing KWID RXT and KWID RXL 1.0L SCe. The Renault KWID 02 Anniversary Edition will offer segment leading length, power to weight ratio, boot space, ground clearance and cutting edge technology. Led by its SUV inspired design, it comprises of several first-in-segment features including the 7-inch touchscreen MediaNAV system, digital Instrument cluster, one-touch lane change indicator and radio speed dependent volume control. Best-in-class features include its boot capacity of 300 litres, ergo-smart cabin, multiple storage spaces, upper segment body dimensions, interior space, service parts maintenance cost, ride & handling and several personalization options. With chic new exterior design elements, adorned by red with white accents, and white with red accents the Renault KWID 02 Anniversary Edition offers a sleek profile that further expresses the vehicle’s sportier side. The new SportLine graphics with 02 Insignia and the Angular 02 Insignia on the hood, distinctively indicates the exclusivity of the 2nd Anniversary Edition. In addition, unique and stylish cosmetic upgrades like the C-Pillar and roof SportLine graphics, two-tone ORVMs, painted SportLine style wheels and front and rear skid plates, instantly boost KWID’s exclusive appearance. Complementing the dynamic and sporty exterior, the interior of the KWID Anniversary edition is further enhanced by appealing design elements like the new seat upholstery with contrast 02, ivory contours on the centre fascia and on the AC vents and a dual tone gear knob. Additionally, the new SportLine seat upholstery, floor mats with 02 insignia, and the sporty steering with 02 Insignia culminate to add flair to the vehicle’s interior. The vehicle’s interior has been embellished consciously with design elements in order to accentuate the vehicle’s sporty exterior. The Renault KWID 02 Anniversary Edition will add greater diversity to the KWID range, taking forward the positioning of KWID as a car that enables customers’ to ‘Live For More’. The 1.0 litre Smart Control Efficiency engine (SCe) which powers the 1.0L SCe range is optimally designed for better performance. The 4 valves per cylinder of the Double Over Head Camshaft (DOHC) layout ensures low pressure drop and super- efficient valve lift for a higher air filling; thus allowing the engine to make usable power at low end, mid-range and high-end rev bands. This high technology engine offers excellent drivability, be it slick city streets or on the highway. The 0.8 litre SCe range is powered by a 54bhp, 799cc, three-cylinder engine, paired to a five-speed manual transmission. To celebrate the first anniversary of KWID, Renault embarked on an iconic drive with the KWID from India to France. The vehicle traversed through 13 countries and some of the toughest terrains covering 18,996 kms before reaching Paris, proving its superiority and reliability. KWID stands testament to Renault’s focus on getting the fundamentals right, in terms of product, design, features, technology, launch timing, value and strategy. Renault has a very strong product lifecycle plan for KWID in keeping with evolving customer preferences and will continue to raise the bar in the mini hatchback segment in India. With the KWID range comprising of the 0.8L, 1.0L MT, 1.0L AMT and CLIMBER, Renault has made its intent clear of keeping pace with global innovations and at the same time launching products to suit the local needs with a strong product lifecycle plan.